SPW053451 SCOTLAND (1937). General view, Springboig, Glasgow, Lanarkshire, Scotland, 1937. An oblique aerial photograph, taken facing east. 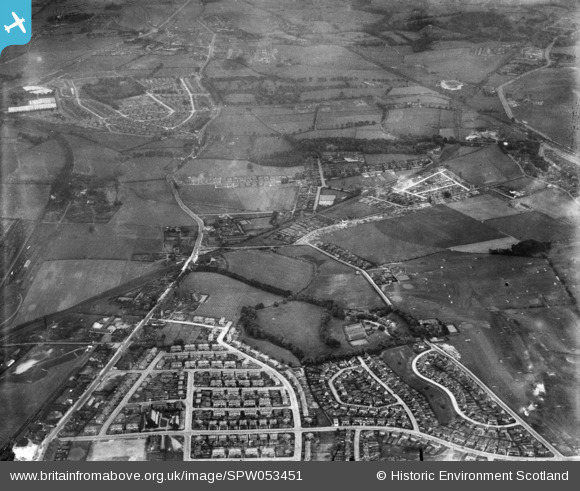 Title [SPW053451] General view, Springboig, Glasgow, Lanarkshire, Scotland, 1937. An oblique aerial photograph, taken facing east. Approximate location of this tram heading out to Baillieston. Eastmuir Street looking westward. About 1904. At this period the section of Shettleston Road from Fingask Street to Annick Street was known as Eastmuir Street. In the photograph James Stevenson's public house is now the courtyard of Lodge Eastmuir No.1126 and the adjacent tenement 1527-1541 Shettleston Road. The Sheiling Bar, August 2005. closed down. St. Serf’s Episcopal Church – about 1960. The Kirk with graveyard. Note the Kirkhouse Inn on the left. Broomhouse Station: This station was closed to passengers back on 24/9/27 (goods on 1/9/53), but passenger trains continued to Bothwell until 4/7/55. However, traffic of some sort was evidently still passing in 1961. Sandyhills Parish Church, now demolished and replaced. This photograph from this spot in Sandyhills Road shows the huge tower blocks now towering above the semi-detached cottages below. Forbes - Newsagents and Tobacconists, 1406 Shettleston Road - about 1917. Robert Forbes standing in the doorway of shop he took over in 1917 and opened as a Newsagent and Tobacconist and which was run by the Forbes family over three generations. The shop stood at the corner of Killin Street and Shettleston Road and the street names on the side of the shop wall show that Killin Street was previously Dalree Street and before that Church Road. The Grange - about 1914. On the left the sleeper fence along the railway cutting and in the distance the bridge taking Sandyhills Road over the railway line A Large house, which due to to its close proximity to the old Shettleston to Hamilton railway line, (the Glasgow city boundary for many years) was often referred to as the last house in Shettleston. The picture shows 'The Grange' and how it looks today, the bungalow on the left in Loch Laidon St being the approximate location of the old Grange house. 225 Hamilton Road. The new Children’s Hospital at Oakpark, Mount Vernon was opened on October 5, 1921 by Thomas Thornton Macklin Dishington, Patrick, Fairlea, and Adam Lees and Lady Blythswood, in the unavoidable absence of HRH Princess Louise, Duchess of Argyll. The building has since been demolished and replaced by flats, though the entrance gate survives. The picture shows the gate as it was then and how it looks today. 'The Cottage' at 221 Hamilton Road a large house which became the Golden Gates Hotel and later the Stakis Mount Vernon Hotel, now demolished. I got married here in 1978.